CH. Talbot Hill’s Opus Too, “Michael”, was just four months old when I was diagnosed with non-Hodgkins Lymphoma. He was one of the nicest puppies that I had bred and I was excited to have this stunning young prospect in my backyard, but…I knew that I wouldn’t be able to do him justice. 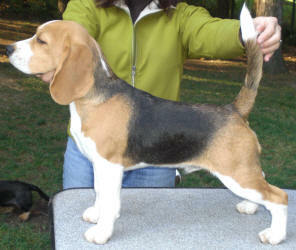 Michael went to Teresa Gaier at Copper Rose beagles where he sired 13″ littermates BISS CH. Copper Rose Myles of Smiles and CH. Copper Rose Murph the Smurf. Michael is now owned by Bill Nieland. Talbot Hill’s Opus Too BISS CH. Ha-Penny’s Too Much Trouble CH. Talbot Hill’s Opus One (13″) CH.